A dual chamber manual pump designed to inflate your board fast. Pump on both chambers to get the board up to shape, remove the red stopper from the back of the handle and continue pumping on just the high pressure cylinder to get your board up to pressure quickly and easily. Air is only expelled on the down stroke so pumping fatigue is reduced. 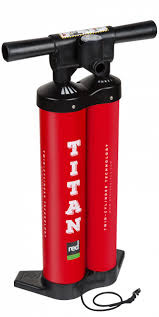 The Titain is slightly shorter than most single cylinder double action pumps which means complete strokes are easier with a titan. 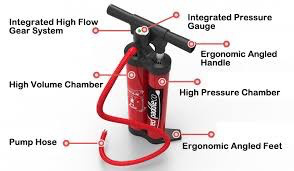 Easily readable and accurate gauge with recommended pressures for different inflatables. Comes with a selection of attachments for connecting to a range of inflatable items.